Take a few minutes and enjoy these informative (and entertaining!) 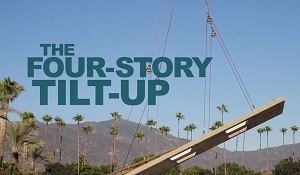 videos that demonstrate the Tilt-up process. Hakanson Construction proudly presents this video showing an incredible 4-story panel raise of the Hale Medical Center Building in Arcadia, California. The tilt-up portion of this project was a highly successful collaborative effort with the general contractor, Hale Builders and Developers and Miyamoto, the structural engineer. Click the Play Button on the video controller to the left to view this video. See Hakanson Construction in action in this fascinating time-lapsed presentation. The Tilt-up method provides speed, durability, versatility and cost savings...even beauty. Compare Tilt-up to conventional construction methods...you'll be glad you did!